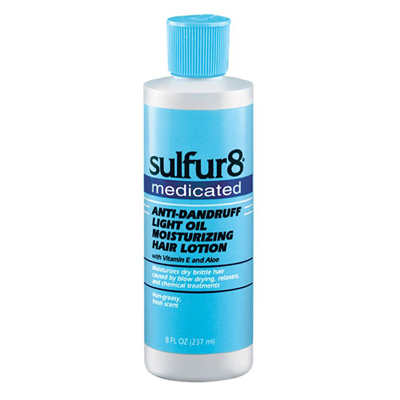 Sulfur8 Anti-Dandruff Oil Moisturizing Hair Lotion -Blue bottle-light formula An extra-light, non-greasy, oil moisturizing hair lotion that is designed for daily use to moisturize and protect your hair. It's rich oils and emollients, including Vitamin E and Aloe. Directions: Shake well before using. Pour a small amount into palm of hand. Rub hands together and gently massage through hair. Use directly on scalp to control dandruff and itching. Use: Control scalp itching and flaking due to dandruff. When using this product, do not get into eyes. If contact occurs, rinse eyes thoroughtly with water. Stop using and ask a doctor if condition worsens or does not improve after regula use. Keep out of reach of children. If swallowed, get medical help or call a poison control center at once. Directions: Apply to the affected area 1-4 times daily, or as directed by a doctor.